Internationally known harpist Gail Barber performs and composes music in many styles: classical, pop, folk, jazz, and New Age. A graduate of the Eastman School of Music, she has been featured at the Edinburgh (Scotland) Harp Festival, International Istanbul (Turkey) Music Festival, World Harp Congresses (Vienna, Jerusalem, Maastricht) and the Opening Recital of the American Harp Society National Conference. Especially interested in the use of the harp for music healing, Gail has worked extensively with a holistic health care practitioner in Santa Fe, New Mexico, Ingrid Naiman. 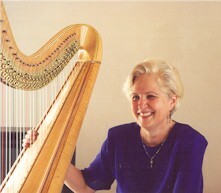 Gail performed the closing concert at the First International Harp Therapy Conference, March 11-13, 1999 in Richmond, Virginia, and at the Congress for Spirituality and Cancer in Tourettes-sur-Loop in France, June 10-12, 2000. Gail is available for recitals, workshops, residencies, lessons and harp healing sessions. She enjoys helping harpists of all levels with empowerment and relaxation techniques (hands-on), improvisation, arranging and interpretation in all styles. She has composed and transcribed numerous works for harp and harp ensemble. Outstanding students come from all over the world to Texas Tech University, Lubbock, Texas, where she is Professor of Harp.